Let our custom-tailored campaigns do the work. IT’S TIME TO KEEP THE CONVERSATION GOING. Managed SEM (Search Engine Marketing) is a crowded marketplace with agencies touting their ability to increase quality scores, lower click prices and dominate impression shares all while cleverly avoiding what clients want the most, CONVERSIONS. At GreenBanana we are laser focused on TRANSPARENT CONVERSIONS and each and every one of our campaigns is tailored to maximize the goals most valued to them. We optimize all our client campaigns to maximize ROI rather than clicks or spend! Helping you improve your website or landing page lead capture abilities. Installing transparent detailed conversion tracking through YOUR Google Analytics account. Having our in-house, certified PPC specialists build out and manage your campaign. 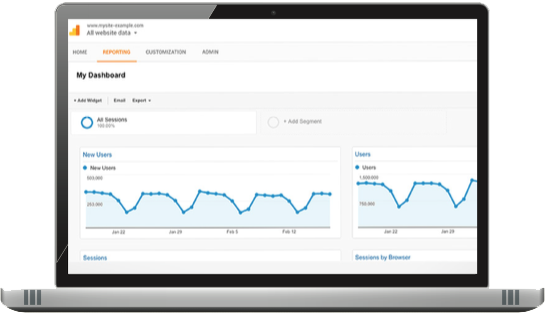 Creating your custom reporting dashboard to track orders, leads, forms, phone calls, etc. Setting up monthly conversion optimization calls because “Set it and Forget it” DOES NOT WORK! No, seriously. Managing campaigns focused on optimizing conversions is both an art and a science. While constant human involvement is absolutely critical to a campaign’s success, what if you could constantly calculate the best time of day, device, ad position, ad copy, ad group, landing page, location, and ad extension to deliver the most conversions? And what if you could adjust your bidding in penny increments every hour to ensure that your conversion clicks are the lowest they can be to deliver the maximum ROI? GreenBanana’s proprietary conversion management system (CMS) does just that. Whether you need sales leads or if you are selling products via e-commerce, we leverage our digital management experience across more than 250 industries to dive deeply into your business metrics and understand your products and services, delivering you the most conversions possible.